A pack of 100 strong grey mailing postal bags, size 28"x34" (700mm x 850mm), with 40mm 'peel & seel' lips. Perfect for mailing your items at a very cost efficient price. A pack of 100 strong grey mailing postal bags.size 24"x36" (600mm x 900mm), with 40mm 'peel & seel' lips. Perfect for mailing your items at a very cost efficient price. 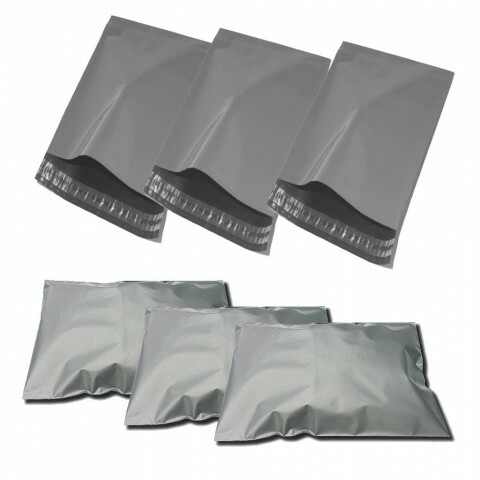 A pack of 100 strong grey mailing postal bags, size 21"x24" (525mm x 600mm), with 40mm 'peel & seel' lips. Perfect for mailing your items at a very cost efficient price. A pack of 100 strong grey mailing postal bags, size 17"x24" (425mm x 600mm), with 40mm 'peel & seel' lips. Perfect for mailing your items at a very cost efficient price. A pack of 100 strong grey mailing postal bags, size 16"x21" (400mm x 525mm), with 40mm 'peel & seel' lips. Perfect for mailing your items at a very cost efficient price. A pack of 100 strong grey mailing postal bags, size 14"x21" (350mm x 525mm), with 40mm 'peel & seel' lips. Perfect for mailing your items at a very cost efficient price.